2010 Nest Check Final Results Are In! The final tally is in and our numbers were up. 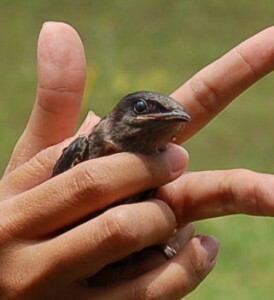 We offered more compartments and had 3 late nests that ran our season into late July. We also offered 3 low hanging gourds on shepherds hooks that were less5 feet off the ground and all filled with both SY and ASYpairs. Thankfully no purple martins needed to go to the rehabber but unfortunately the resident red shouldered hawk caught several fledglings. Plans for next year include the repair of the nest cam, another aluminum house to put up on our multi-purpose purple martin pole and whatever else I can dream up for next year. One Nest To Go-But Where is Mom & Dad? The last remaining nest is on the numbered gourd rack. Gourd #6 has 5 nestlings that I have neglected terribly. I had watched the ASY male and SY female feeding vigorously 3days ago. Yesterday I saw no feeding but the racks have been covered with purple martins for the entire morning and well into the afternoon. I was sure that I just missed them. Today I saw two little heads poking out of the front of the Troyer horizontal gourd. I was sure that the nest had been hijacked by a lazy fledgling as the two heads looked so vastly different in ages. So I lowered the rack. When I opened the gourd I noticed it was pretty dirty, but I had seen worse. I proceeded to take everyone out and put them in the 5 gallon bucket to do a nest change. When I looked at the nestling however, I noticed that 4 of the nestlings looked to be about 20+ days old and the one runt seemed to be lagging way behind. He had the feathering on his body and head of a 16 day old but his flight feathers were about the same length as his nest mates. On further exam, I found all of them to be underweight. 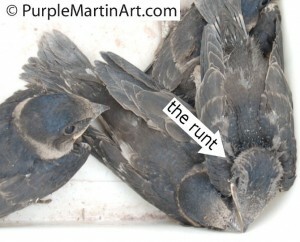 The runt, worse of all and another nestling not to much better. All had an easily palpable keel bone. What is a keel bone? 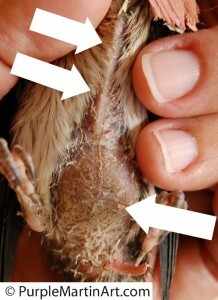 It is the bone in the center of the birds chest that should be surrounded by breast meat. The runts keel bone stuck out like a razor, skin flaky and dry. He proceeded to poop on me but then I saw his large hard abdomen. And when I say hard, I mean hard like a rock. And unless something is made of bone (or cartilage) there is nothing on a living body-human or animal that should be that hard. I kept him out of the nest and replaced the others. A Bot fly? A partial blockage? A tumor? I do not know what his problem is but I am vigorously re-hydrating the poor fellow. Observing the nest is difficult with 2 young boys getting into everything but I tried to watch for mom and dad martin to no avail. The entire time I was checking the nests, changing, etc, there were no concerned parents flying about. I am beginning to think that an Owl has attacked and flushed the parents out. The nestlings being to young stayed safe in the dark far reaches of the Troyer gourd but without mom and dads care, they will soon expire. Since Folke Peterson Wildlife Center is closing soon I placed a call to Busch Wildlife Center in Jupiter, Florida. I spoke to the director and if the nestling is still alive in the morning I will take him there. I will try to observe the nest to make sure that the parent/s are feeding. If not, I will remove them all and take them to the rehabber. It can be a case of late nest syndrome (I just made that name up) but all that means is that in very late nests it is not uncommon for one (or both) of the parents to loose interest in the process and slack off. My first purple martin pair was a ASY male and a SY female. She worked her tail off and he would come by a few times a week. He would sleep in the gourd on occasion but basically left the entire raising of the clutch to her. She successfully fledged her 2 nestlings-all alone- after all the martins were gone. But as for this nest, I am concerned. OK, the drought is officially over. The water has been coming down in buckets so much that the pool is over flowing and when you stand on our back patio you get the feeling you are on a ship or an island. Ducks were actually swimming by where dry land was only last week. Nest checks are almost impossible on the numbered gourd rack due to the standing water by the base of the pole. If I had a pair of waders I would have used them. The lettered rack now has too many nests close to fledging to do a check. The purple martins on the nestcam have long since fledged and though they are still returning to sleep, most of the others on that rack are not, as per my previous post. Mornings are still quite active with visitors and fledglings flying about. Evenings are getting more quiet with all birds in the gourds well before dark. The new nestling in the Sunset Inn house is missing and no further eggs have hatched. Now only 6 of the eggs (of eight) remain and of those remaining eggs most seem far along in development. The translucent pearly quality of the eggs is gone and the remaining eggs seem dark and heavy. If they are still being tended to, they should be hatching shortly but if they have been abandoned then they were very close to hatching and taking into consideration that one nestling did hatch, I am thinking the nest was abandoned very soon after the nestling hatched and the remaining eggs have since perished. Another terrible blow to the egg / hatch / fledge ratio. Next year I will make sure that the house is positioned so that I can view both sides from the patio. Though the birds seem to like the open fly way on the north side of the housing, I will have to make the change so that I can better see what is going on with the nests. The bigger problem at the moment seems to be lazy fledglings. Several fledgelings have taken to hijacking nests to steel food from nestlings. It seems that once the fledgling is in the nest the parents can not distinguish these young from their own and will feed them. The spoiled brats sit and wait for their meals to arrive while pushing the smaller nestlings out of the way. On the last nest check there were 2 nests of younger birds 12 & 18 days old) that had older, already fledged birds stealing food from them. I evicted them but I wonder if this behavior had something to do with the little nestling dying. Somethings we will never know. I recently posted of theck, nest change driving rains that we have been having. Several severe problems are making themselves evident. First off, on the lettered gourd rack, I apparently drilled the air vents on the backs of the Troyers incorrectly as water is wicking inside the gourds of several of them. Even the nests that I changed just 2 days ago needed a another nest change. On Troyer Horizontal Gourds you have the option of drilling 2 air vents in the backs of the gourds. One has to drill them at an upward angle to keep the rain from blowing inside the gourd. I beleive my problem to be that I did not drill them at a steep enough angle. Not that it is a huge amount of water under the usual circumstances but this last week and a half of crazy rain has pushed all of Murphy’s Laws to the limit. I wanted to make sure that all are aware of the vital need to do nest checks after such rains and to be prepared to do nest changes. A wet nest can spell disaster for your nestlings and only spells trouble. It is a problem that is easy to fix but can cause huge losses in a short amount of time. Only 2 days since the last nest change and when I opened the gourd that seems to be the worse off, the nest was well on its way to being a putrid mess. The nestlings feathers were damp and dirty. I cleaned the nest out thoroughly and I believe they will fair well with continued nest checks through this bad rain. My only concern is that a nest is approaching fledge time and that means nest checks will slow down to prevent premature fledging. I am tempted to bring the rack down tomorrow and caulk the air vents closed to prevent any further issues this season. Unfortunately the nestling in gourd “E” with the cyst/mass on its abdomen did not fair as well. 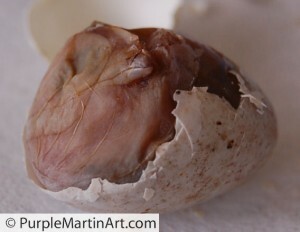 Though the nest was dry the nestling was dead for at least a day and was very smelly. Though it almost appeared sleeping, it did not look peaceful and the 3 other nestlings in the gourd were huddled as far away from the stink as possible. I can only imagine what would have happened if I was not doing nest checks. I disposed of the poor baby and checked the other which seemed none the worse for wear. The take away? DO NEST CHECKS!Unless there is a nest that is close to fledging, I do not believe that you can do too many nest checks. As long as you try to oblige your birds with a decent time of the day to do the check, you can not go wrong with checking the nests daily when a problem is suspected or in this case of problematic rain. If you are fearful or unsure of how to do a nest change and want to watch a video of a nest change being done click HERE. In death there is often life and with the death of this poor nestling a new nest of 3 nestlings was discovered. 3 eggs and now 3 nestling huddled together (in a dry nest-thank God) reaching up with mouths open. The miracle of life makes all the stink and disgusting mess soooooo worthwhile. I will do this as long as I live. 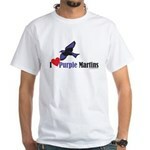 Hopefully I will instill the same love of Purple Martins in my sons and they will carry on in my stead. I did the last nest check yesterday that will be done for a while on the gourd rack that is on the birdcam/colonycam. The nestlings in gourd #9 are now 28 days old and they are looking like they could go at any time. To prevent premature fledging after I lowered the rack (oh so quietly) I placed a sock in the gourd opening. I had tied a string to the sock so after the check was doen and the gourd rack raised up, I could gently pull on the string to remove the sock. All went well on the check and the babies looked wonderful. No bugs, fat and lean with hints of blue showing on their fresh new feathers. The next time I see them, in early 2010, they will be sun-bleached brown. There are at least 5 nests that seem to be abandoned. There are 3 scenarios I believe could be at play for this situation. It could be a case of egg dumping or it could be young inexperienced SY’s playing house or lastly, drought affecting food supply thus reducing clutch rates. Whatever the case may be, I have come to terms with my goal of reaching the magical 100 mark having to wait till next year. No more snake attacks and the bird/snake netting along with the spray foam in the holes of the S&K predator pole guard will let me sleep at night. In the picture you can see the white dried foam coming out of the holes in the guard that allowed the snake to pass through. 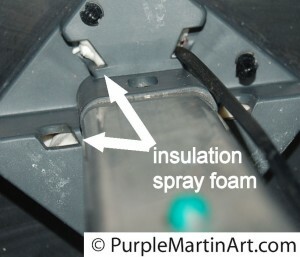 The foam is commonly found in hardware stores and a common brand name is “Great Stuff insulating foam sealant” or “Handi-foam”. It actually comes in handy for several things and I have heard of some folks using it to modify cheap plastic purple martin houses to increase the insulation and help keep internal temps comfortable. One thing I should mention to those considering an inexpensive purple martin house. Consider the amount of effort you will put into the house modifying it and the life expectancy of the house itself. If you expect to get more than a handful of seasons out of the house you may very well be overly optimistic. Sun and UV rays can change plastic and you may notice discoloration or loss of opacity and brittleness. Though some may disagree, more light means more heat and it is generally agreed upon that darker is better, when it comes to the interior of a purple martin house. 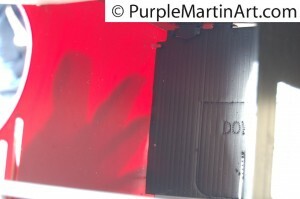 The plastic can always be painted with a product like Fusion paint for plastic but again, now you are adding your time and money into the upkeep. My point? 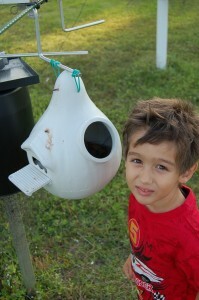 Always consider these factors when deciding what kind of Purple Martin house you want to buy. 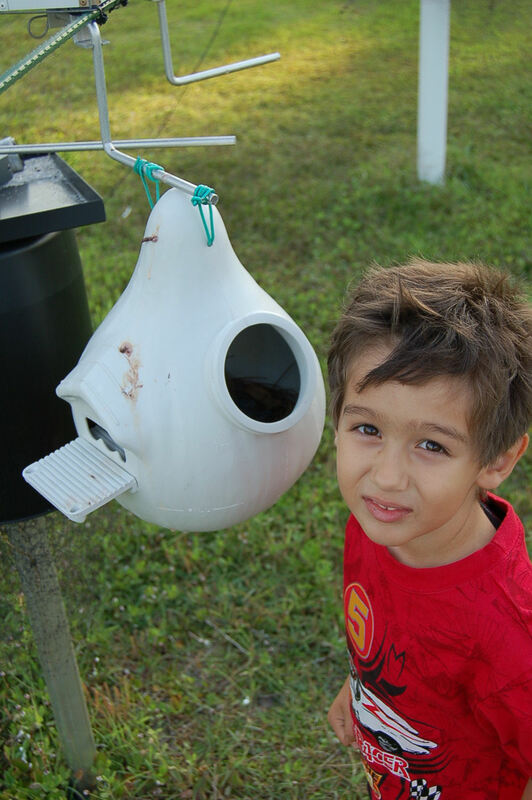 Want to read more about deciding on a purple martin house? Click here for an article on “what you will need” which talks about all the different types of housing, pros and cons to help you decide.